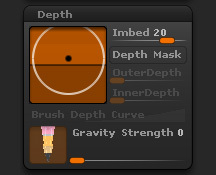 The Brush > Depth sub-palette controls how the brush is placed relative to the mesh surface. The Brush Placement window allows you to control the embed of selected brush by moving the sphere up or down. The black line defines the surface and the Sphere represents the Inner and Outer Depth of a Brush. When Depth Brush Masking is enabled a black dot will specify the Outer Depth and Inner Depth of your brush. The Brush Imbed will control the embed of selected brush. Brush Imbed gives a brush a definite control on how a brush will interact with a surface. This will allow a slight deformation on the surface or a more extreme deformation on the surface. The Brush Depth Masking button will apply a virtual mask to the brush radius in an InnerDepth and OuterDepth. This setting will affect RGB and sculpting details. By adjusting the InnerDepth to a lower level less of your brush will apply a subtraction into the surface. If the OuterDepth is set lower then less of the brush radius will affect any high peaks. The InnerDepth slider will control inner cutting depth of a brushes radius. If the InnerDepth is set to a -1 then the entire radius of the brush will cut into the surface. Setting the slider to settings anything below -0.5 will only cut into the surface at 50% or less. The OuterDepth slider will control now much the brush radius will affect the surface peaks when sculpting along a surface that has several plain changes. In the Example: Red Stroke has a setting of 1, which will apply color to elevated mesh at 100% of the brush radius. Green Stroke has a setting of 0.5, which applied color to the elevated mesh at 50% of the brush radius. Blue Stroke has a setting of 0, which applied no color to the elevated mesh. The Brush Depth Masking is on, this curve will affect how strongly automasking will be applied in the InnerDepth or OuterDepth. The curve will create a gradual roll off of the stroke. The Gravity arrow determines the direction your sculpting will be pulled in as you work. Click and drag in the arrow box to set the direction. Gravity Strength determines the amount of gravity push or pull as you sculpt. Set to 0 for no gravity effect.